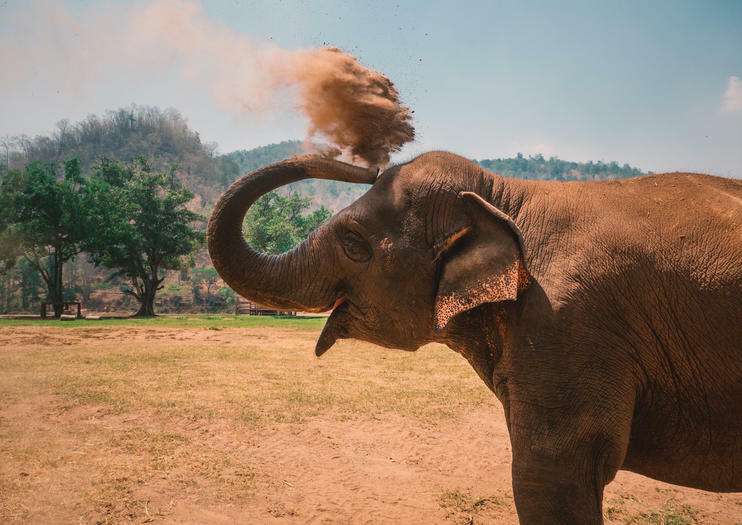 A sanctuary for former ill-treated Asian elephants, the Elephant Nature Park encourages visitors to learn about the plight of these mammals and their habitat through activities, such as feeding and helping to care for the resident herd. Elephant rides are not offered at the park, a policy the park encourages in other elephant camps. Most travelers visit the elephant sanctuary on a day trip from Chiang Mai. A daylong elephant experience includes the chance to observe the animals in the forest, feed them fruit from a viewing platform under staff supervision, and assist with bathing elephants in a nearby river. Funds raised here support efforts to reforest habitats for wild elephants, and the park also houses a menagerie of other rescued animals from Northern Thailand, including dogs, cats, and birds. Food for the elephants is purchased locally to support area farmers. This elephant rescue center is a must-see for animal lovers and families. Common areas of the elephant park offer free Wi-Fi access. A full-day park visit includes hotel pickup and drop-off in Chiang Mai city and lunch. All experiences at the elephant park are suitable for all fitness levels. The park has a restaurant serving both Thai and Western vegetarian dishes, buffet style. Be sure to book your experience in advance as they tend to sell out. The Elephant Nature Park is located just under 40 miles (64 kilometers) north of Chiang Mai at 1 Ratmakka Road, Phra Sing. The journey takes about 90 minutes. Full-day experiences at the park take place daily throughout the year, with hotel pickup early in the morning and drop-off during late afternoon. The best time to visit is between October and April, when the weather is cool and relatively dry. While the single-day visit is the most popular option at the Elephant Nature Park, visitors can opt for longer stays as well, ranging from a short overnight visit to a full week of volunteering. Dit is de perfecte keuze voor dierenliefhebbers. Breng een dag door met het zien van het geweldige werk dat wordt gedaan in een opvangcentrum en een opvangcentrum dat zorgt voor olifanten - Elephant Nature Park. Na een ontmoeting in Chiang Mai reist u met gemak in een comfortabel voertuig. Onderweg ziet u een prachtig uitzicht op het platteland. Zodra je aankomt, zul je lange bezoekerslijnen omzeilen, want toegangsprijzen zijn inbegrepen. Verken het park met een gids en geniet van de tijd om olifanten te zien spelen, zwemmen en ontspannen.